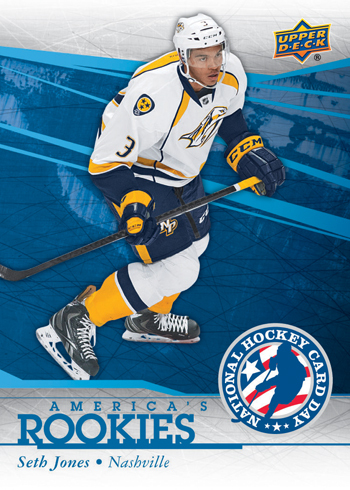 Production Preview: 2014 Upper Deck National Hockey Card Day is Coming Saturday, January 18! There are a number of ways to take part in the promotion. The easiest is to visit your local card shop and you can get an updated list of shops participating right here on the National Hockey Card Day website. Go through the list and start planning your routes (note: the lists are sorted by telephone area code). Simply visit those shops on Saturday to receive a FREE pack! The set is bigger than ever with twice as many rookie cards than in previous years to celebrate Upper Deck’s NHL® Double Rookie Class! There is a special 21st card available in Canada and the U.S.A. as a gift with purchase. Simply purchase $10 in Upper Deck product and you can get that card while supplies last featuring two standout rookies. And as in previous years, some collectors will be surprised when they open their packs and find limited-edition autograph cards of players from the set. This year Upper Deck went all out and provided more autograph players than ever before with four different autograph cards available in the Canada and U.S.A. sets. If you are lucky enough to pull one of those, make sure to let us know! We will share the checklist of autograph cards that can be found on Friday, January 17. 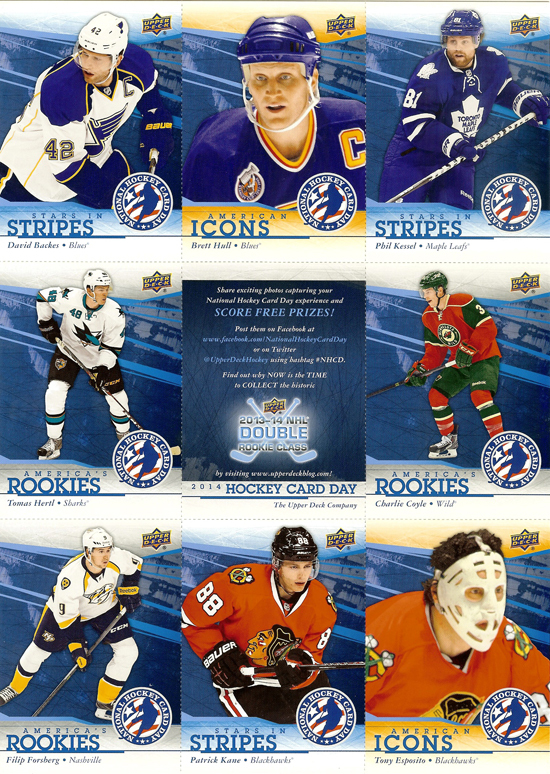 Upper Deck also created some very cool 8-card sheets for the event that are available in some various locations. Fans can find five different sheets in Canada at London Drugs stores and Toys “R” Us in particular. They will also be available at the Hockey Hall-of-Fame while supplies last and some other shows and NHL® arenas throughout Canada on January 18. In the United States the 8-card sheets will be a little more difficult to find as they will only be sampled at the New York Islanders game on Saturday, January 18. Upper Deck will also be donating several thousand of these sheets to the Defending the Blue Line charity which helps military families who are passionate about hockey and Operation Gratitude who send care packages to troops serving overseas and veterans here at home. As we have seen in previous years, many families (especially fathers and sons) make a day of this event, creating great memories and bonding while they visit different shops to put their set together. And Upper Deck wants to encourage fans to share those moments with us! Share exciting photos capturing your National Hockey Card Day experience and you can score free prizes like packs, autograph cards and Upper Deck Authenticated memorabilia! 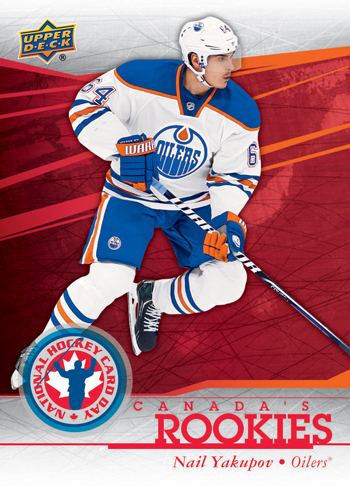 Post them at Upper Deck’s National Hockey Card Day page, on Twitter @UpperDeckHockey using hashtag #NHCD or send them to us via email! 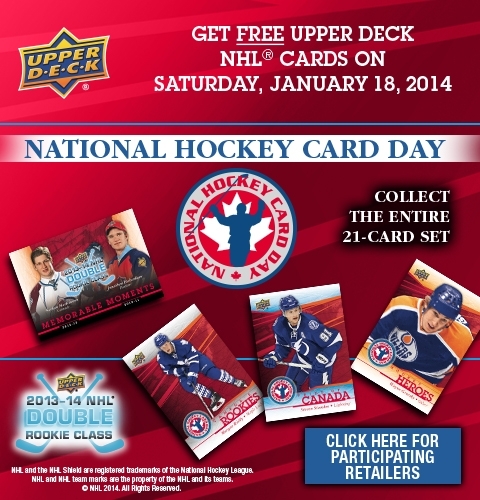 You must include an image of the 2014 Upper Deck National Hockey Card day cards to be considered for a special Upper Deck mail day! If you do not have a participating Certified Diamond Dealer, retailer or arena in your area, you can request a free pack as well. Please understand, we only have a limited amount of free packs available for this portion of the promotion and we will only send it them to fans who are not within 30 miles of a participating partner, so please take the time to review those lists before you reach out. 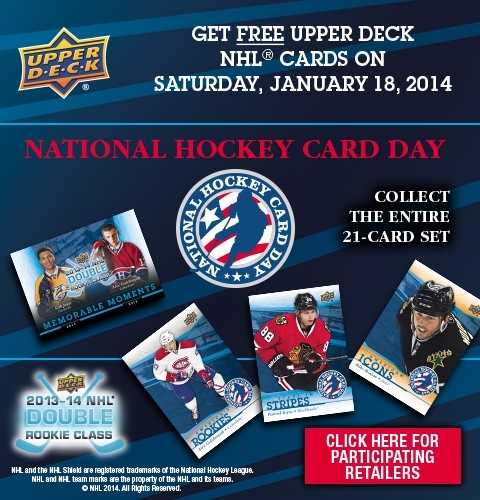 For your opportunity to score a free National Hockey Card Day package if you do not have a participating partner within 30 miles, please email us an image of you holding Upper Deck NHL® cards with no more than four complete sentences as to why you love Upper Deck NHL® trading cards. We will work to assist the first fans who message us with the appropriate information with a free pack. Year in and year out, Upper Deck’s National Hockey Card Day has been a model for everything that is good about this industry. Here’s to making the 2014 event the most memorable and positive in the history of the promotion! I can’t wait! Last years set was awesome and I can’t wait to do this set! 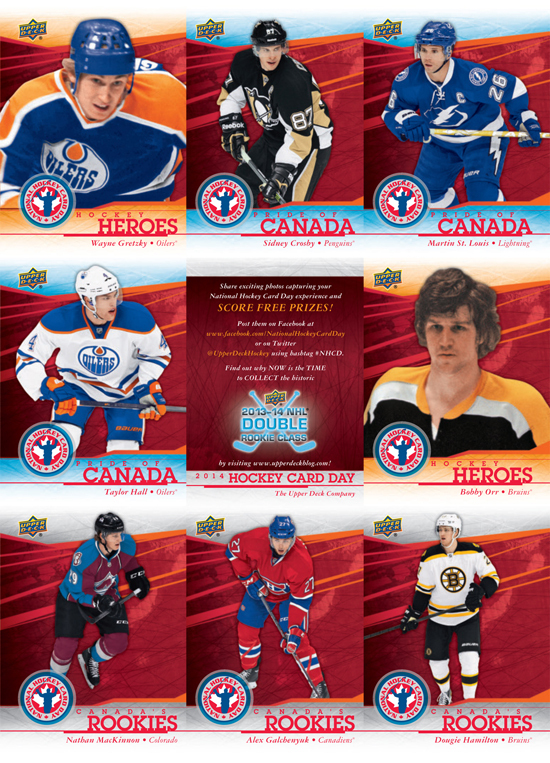 Every year my kids and I really look forward to this awesome hockey card event!! Why no Trouba or Scheifele but Dougie Hamilton in the Canada packs?